Product roadmaps aren't much different from the GPS on your phone. Think about it. You plug in start and end points and follow a list of directions in between. Each turn moves you along to the next destination until you reach the end. Instead of streets, your roadmap lays out the tactics you need to get from concept to launch. It includes things like resources, key dates and team responsibilities. Like GPS directions, each tactic feeds into the next one and together lead to your end goal. With feedback coming from multiple sources, it's possible to take the occasional wrong turn. So how do you filter through feedback clutter to hone in on product features that are in line with your product's vision? Let's take a closer look at the role roadmaps play in product development, how to use them to attract meaningful feedback and how to test that feedback. Somewhere along the way, you've probably heard this quote, “If you fail to plan, you're planning to fail.” What Benjamin Franklin meant by this was that without an action plan, it's impossible to anticipate things or make good decisions. That's where product roadmaps come in. Whether you're ready to launch a new app or upgrade an existing product, your roadmap is your guide. You can zoom out to see the big picture or zoom in to analyze specific tasks and plan on a micro level. With long- and short-term perspectives, you're in a better position to accommodate internal and external stakeholder feedback. It measures how many people want a new feature or process against the likelihood of them using it—otherwise known as adoption and frequency. The sweet spot is in the top right of the scale. These are features that everyone wants and will use all the time. The goal is to get as close to this spot as possible. Is this new feature or process in line with the vision for the product? If so, are people likely to use it? Will it improve the product or will it just bloat the product's scope? Is it a viable, long-term solution? Does it fit in with existing features or processes? Will it make using the product easier for users? After you've run your feature audit, rank the answers to your questions to gauge the potential for the idea. Feedback with the highest opportunity to boost usage frequency or user engagement should be prioritized first and added to your roadmap. If the results show up in the lower quadrants of the scale, dump them and move on to something else. We're living in an age where users demand more transparency from companies. Successful companies have seen a boost in customer loyalty and trust as they make more information available. In order to build a product that sees positive long-term gains, trust is the cornerstone for user retention. In 2015, the folks at Front, a team inbox app, made their product roadmap public. Anyone can access it to see what Front's working on and what they've recently launched. They've adopted a somewhat radical approach to prioritization in that customers vote on features they want to see in the product. It empowers users to share their feedback. Resulting feedback helps Front improve their product faster. It either validates or quashes features that Front perceives as urgent. It builds trust because Front shows they value—and use—user feedback. It holds internal teams accountable to follow through on what was added to the roadmap. Front has been open about the success they've seen with this approach and it likely works for them because they're small and still growing. 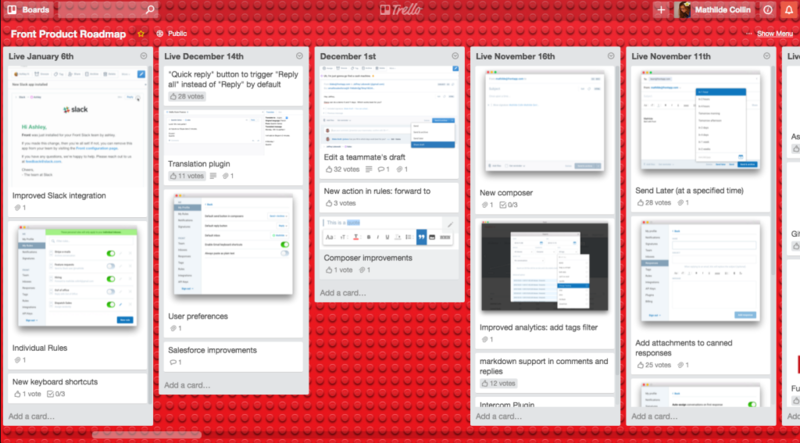 At this stage, a public roadmap helps them learn from their users and helps get users on board. Keep in mind that public roadmaps aren't the answer for everyone. If you're a large and mature company, the last thing you want is too many cooks in the kitchen. Transparency builds trust, but this particular approach has the potential to stall progress. Users aren't going to always agree with what you've planned, but remember that you're the expert when it comes to understanding the context behind the product decisions you've made. A better approach is to increase communication to keep users informed. They'll appreciate the inclusion and you still build trust. Whether you've got a hot product or a new MVP, users are going to give lots of feedback. Because it's important to meet their needs, it's tempting to want to obsess about the next feature you'll release. 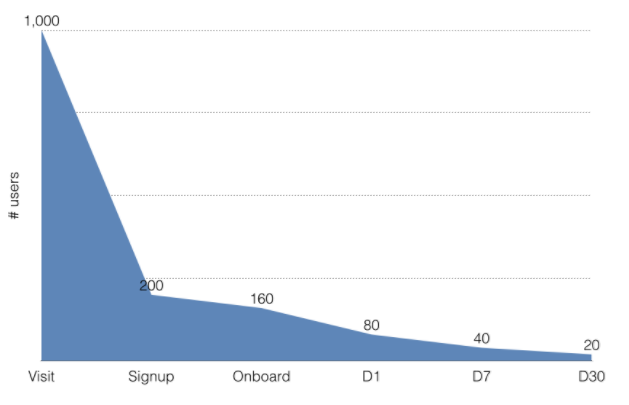 You might be able to attract a lot of attention when you first release the feature, but if it doesn't solve a problem or if it isn't a good fit with the rest of your product, retention takes a sharp nosedive. Every company is susceptible to this fallacy, even Apple. Lots of users find that Apple's current suite of features is too complicated to figure out. If users can't figure out how to use new features, they simply won't use them. When Apple launched the iPhone’s 3-D Touch feature, very few users knew which apps supported it. It's a great concept—press a button to see more options in an app—but users found it confusing. 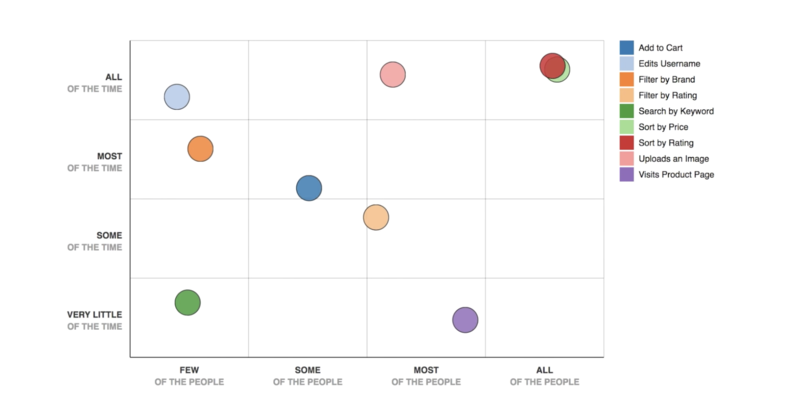 Define who your users are and segment them into groups. Note that just because competitors have certain features doesn't mean you have to as well. Chances are their customers are different anyway. Survey each user group you identify. Let them tell you how they use your product and what they want to get out of it. Keep the surveys short to increase engagement and create urgency by putting a time limit on it. Rank the features according to how many users say they want the feature. Figure out the lifetime value (LTV) of the customers who want the new features. Will implementing the new feature serve to boost their long-term commitment to the company? If after your test, all signs point to a genuine need, add it to your roadmap. Otherwise, adjust the feedback and run it through the test again until it's aligned with the needs of the majority of users. There's a lot of feedback coming your way, so it's important to test new ideas before adding them to your roadmap. Not taking the time to prioritize is like taking a wrong turn. You have to backtrack and eventually plot a new course. Either way, you've lost time. Avoid frustration and plan and analyze before updating your roadmap. You're the product expert, so ultimately you know what's best for your product and what you have to do to stay on track to achieve your goals.